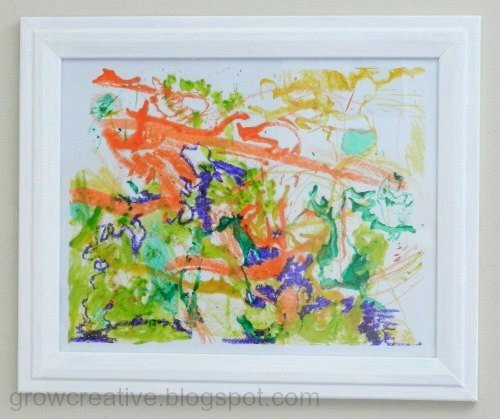 So, you may have seen some lovely melted crayon abstract art on canvas somewhere out there on the inter-webs..... I have! 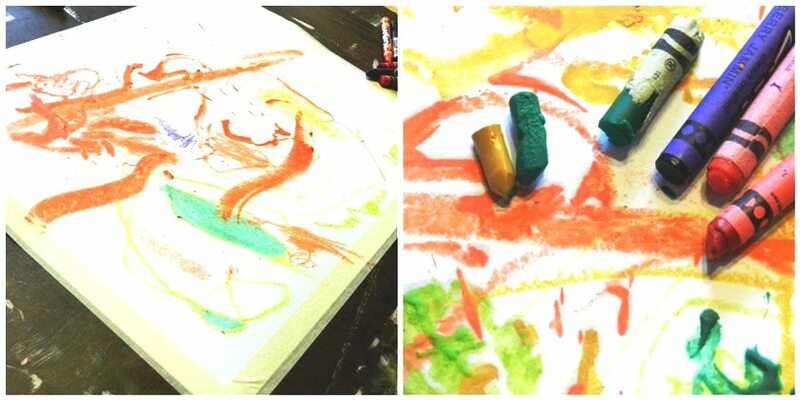 It inspired me to try out some melted crayon on paper with my son. Here's a little tutorial for ya, so you can go make your own Melted Crayon Abstract Art with your kids, your spouse, your friends...... whoever! Step 1: Lay out some paper (I used 90 lb drawing paper because it's a little more durable, but regular computer paper will work too) and tape it down to a table or board. This will make a nice border and keep the paper in place for the next steps. Step 2: Start coloring and scribbling with the crayons. This is supposed to be abstract, so don't worry about making it look like something. Just go with the flow. You can even get the kids involved with this part. Step 3: Start melting some crayon wax on your paper by blowing a hair dryer on high heat on the tip of the crayon (this part should not be done by children). Be careful not to blow that heat directly on your fingers or hands... that can hurt. You can wear gloves or even hold the crayon with some tongs if you want. It takes a few seconds for the crayon wax to melt enough to start dripping, but once it gets to that point, let it drips and flow on your paper. You can hold the blow dryer right next to the melted wax on the paper to blow it in different directions. Step 4: Continue melting wax and doodling all over paper until you feel like you're done. You can do as many layers as your paper can take! Have fun with it! Step 5: After the crayon wax is all cooled, gently pull the tape off the edges and admire your abstract crayon work! Your blog is beautiful. Every piece of it I was able to explore was a pure delight. From your pictures to your ideas to you execution, really well done. Oh Elise! So beautiful!!!! I adore this. What a cute idea and it turned out so fabulously. Very cute, am going to pin this and try with the kids. Visiting from the Inspiration Gallery. This is really neat..I loved it and I also loved your water color stenciled art...I m going to pin that. The colors are so vibrant. I just love how these turned out. Just pinned! This is darling-- it looks so creative and colorful! The technique could even be used as the background for a mixed media piece! Very cute. I've made abstract art and crayon art but never a combination of the two.